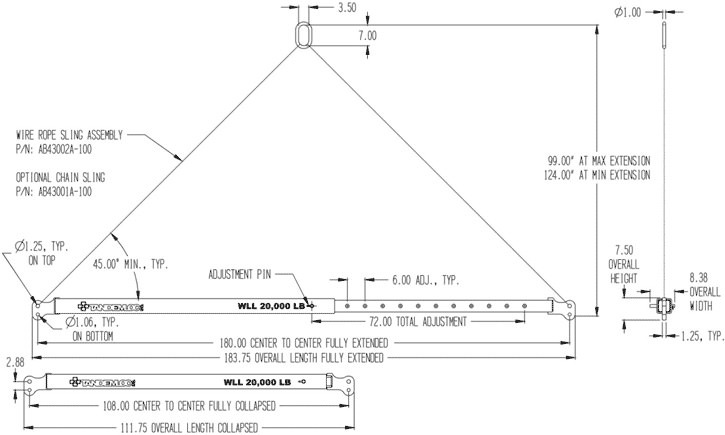 The telescoping bar offers a wide range of minimum and maximum lengths in convenient increments of only a few inches. We have a wide selection of telescopic spreaders, contact us if you do not see what you need. Spreader bar end design can be made with clevis ends to eliminate shackles. Also, the bars can be designed for low sling angles. Everything is proof tested without extra charge. CALCULATED WEIGHT: 352 LB; Wire Sling: 60 LB. ; Chain Sling: 100 LB. Designed and Manufactured to meet or exceed ASME B30.20 and BTH-1, Design Category B, Service Class 0. CUSTOM OPTIONS: Spreaders can be customized for your application, inquire for other load capacities or sizes. Please inform your salesperson if your lifter is to be used in an underwater environment.